It is just before lunch time on October 9th 2016, the day after the parliamentary election in Georgia. 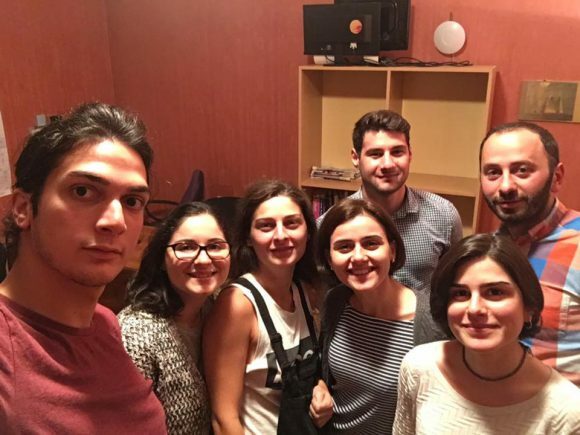 In the offices of local NGO JumpStart, in a noisy junction in the centre of capital Tbilisi, a group of volunteers have been busy since 2 a.m. digitalizing the election results and visualizing them in real time on elections.jumpstart.ge. Maps and tabular allow the user to explore and analyse how election results are distributed by district and precinct. The researchers, programmers and designers at JumpStart Georgia use information and communications technologies (ICTs) to inform and mobilise people, and to increase transparency and support good governance in all regions of Georgia, making JumpStart a text book example of how ICTs can be used according to the ICT4D discourse, i.e. to enhance participation in development (Ferguson, Soekijad, Huysman & Vaast, 2013, p.2). – A few years ago most of the people outside Tbilisi would get access to information only through TV, which still remains the number 1 source of information for most of the people in Georgia. However, Internet and online media is emerging as an alternative source of information which is very important, as TV has always been a political tool in Georgian politics and the means to manipulate the voters and their opinions. As internet penetration in all regions of Georgia has increased (mostly through mobile internet), most of the local Georgians now have equal access to various tools and alternative sources of information, such as JumpStart’s data driven statistics and interactive visualizations. JumpStart translates complex reports, large amounts of data and causal relations into easy to understand visualizations that can be shared and have the potential to become viral in social media. At a quick glance at their Facebook-page it is clear that they align to Guo and Sexton’d model of mobilization–driven relationship-building (2014, p. 70-71), through both public education and calls for action. Nino emphasizes the importance of encouraging fact based solutions on an individual level, and not only on a policy level. – For example, our road safety campaign encourages road traffic participants, such as drivers, cyclists or pedestrians to share the road and consider others around them. As road accidents kill hundreds of people each year in Georgia which has relatively small population, it’s a huge problem in the country right now, so getting informed about the main causes of the fatal accidents and being reminded about it in a more human way, not necessarily with the fear of the fine, has impact on people’s lives and decisions. Even though it is questionable to what extent social media creates sustainable change and engagement, research has even show an inverse relationship between broad online social movement mobilization and deep participation (Lewis, Gray, and Meierhenrich, 2014, p. 7), it is generally agreed that it is a useful tool to inform a wide audience on a particular issue and spark debate and engagement (Artime & Hershey, 2014, p. 637-638). Among JumpStart’s clients and partners are multilateral organisations such as UN bodies, embassies, institutions and development organisations based in Georgia and the South Caucasus, which traditionally use social media quite traditionally, i.e. to share reports and success stories, rather than to prompt dialoge and action (Denskus & Papan, 2013, p. 462). However, according to Nino this is changing, a change that might be partly due to JumpStart’s work. – When JumpStart started 4-5 years ago, we had to talk about the importance of this type of communication and its impact, but now most of our partners understand the need and necessity of data-driven communication, and we can focus on discussing on the hows rather than whys. From humanitarian response to sustainable development?